A non refundable deposit of £50 per week is required to secure the booking and the full balance is to be paid six weeks before the holiday commences. Only one dog allowed per booking at a charge of £30 per week. Any damage caused by a dog is to be paid for by the Person paying for the holiday. These prices do not include FunWorks Passes however if you require passes you can purchase these before your holiday or on arrival at the site. Quilts and pillows are provided but please take your own sheets, pillow cases and quilt covers. Only one dog allowed per booking at a charge of £30 per week. Any damage caused by a dog is to be paid for by the owner of the dog. 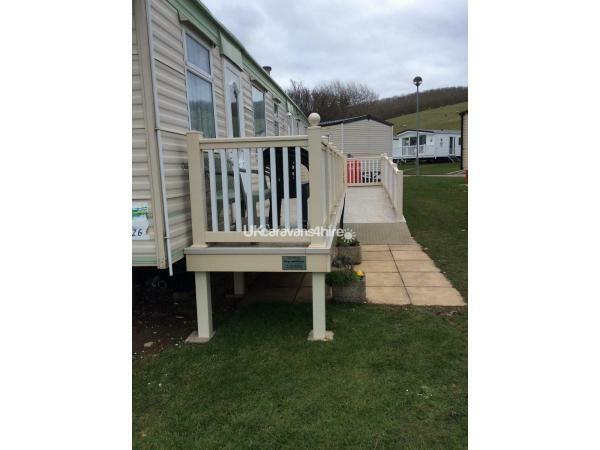 Our caravan at Doniford Bay provides all the comfort and facilities required for a great family holiday. 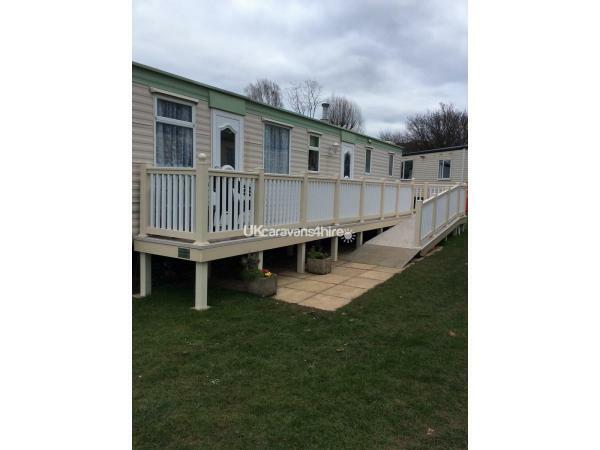 It is situated in a quiet section of the park but is only a short walk to all the parks on-site facilities or to the beach. 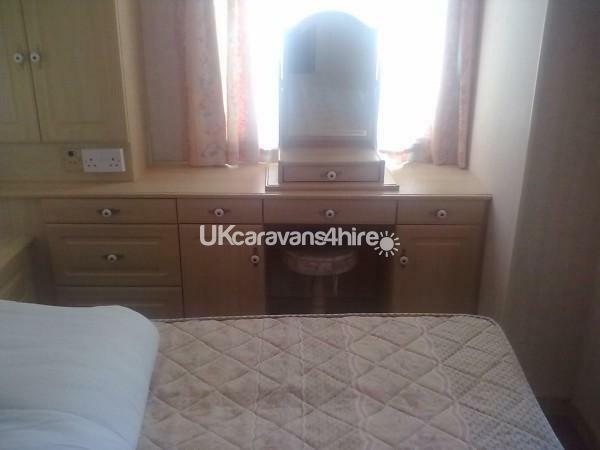 The caravan has 2 bedrooms 1 double with a dressing table, bedside tables, wardrobe with drawers and additional side cupboards. 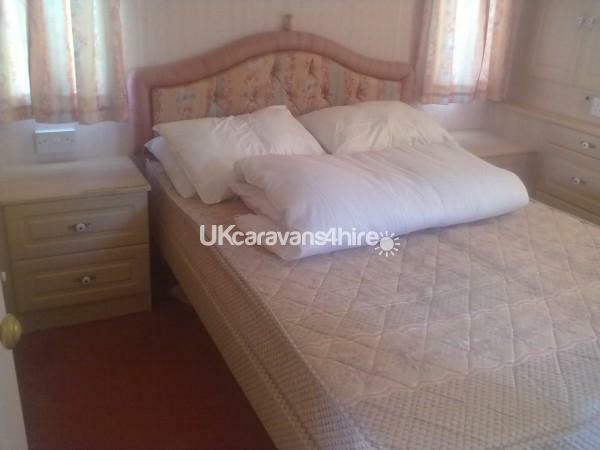 The 1 twin room with wardrobe, a central bedside table, the twin room allows flexibility as the singles can be placed together to make a double. 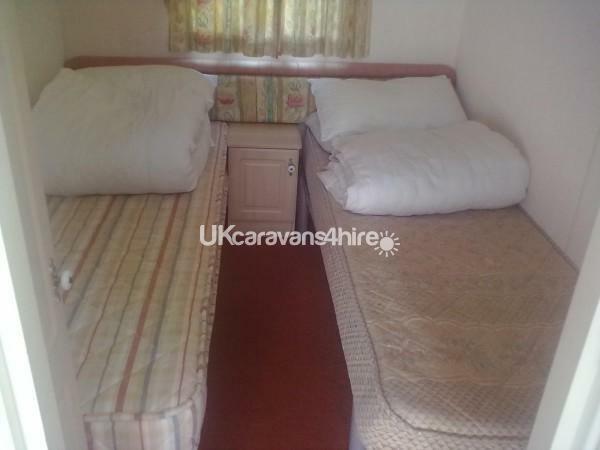 Additionally there is a fold out bed in the living area, allowing families of up to 6 to sleep comfortably. 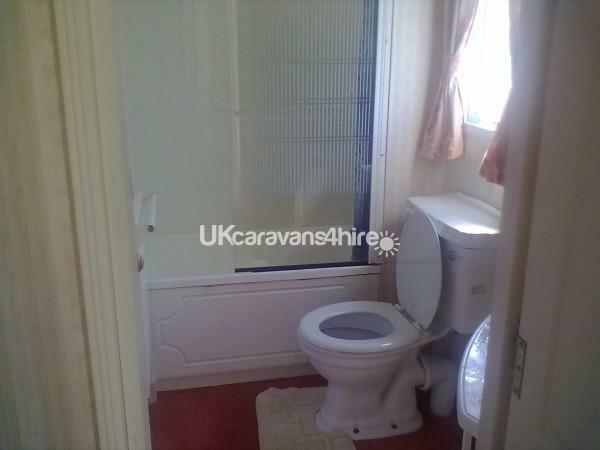 It has an on suite bathroom with bath and a separate second toilet. 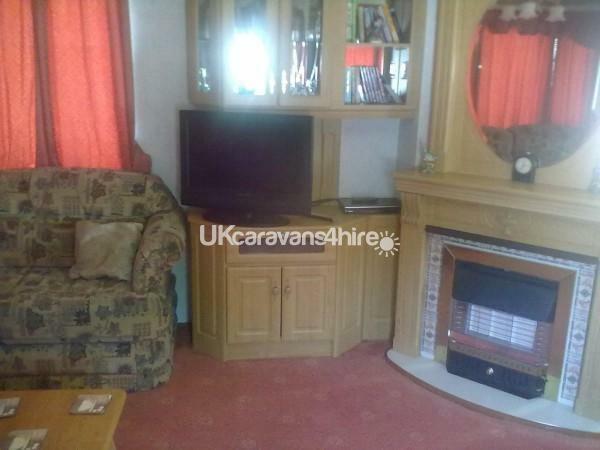 The kitchen has a full gas cooker, fridge freezer, microwave, steamer, toaster, kettle, George Forman and an iron, whilst the lounge has a television with free-view and a DVD player with some dvds and a selection of books, playing cards and a chess set. Outside there is a disabled ramp and a patio area with chairs and a bench with cushions. 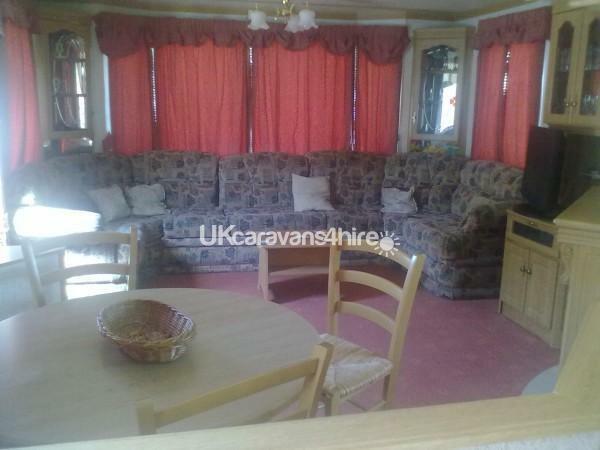 There is double glazing throughout the caravan. For the children there are children's clubs on site, an indoor pool with a toddler area and a seasonal outdoor pool with water slides, a play park, multi-sports area, crazy golf, tennis court, pedal cycles, fencing, archery and water sports. Please note that an additional charge will be made for some of these activities. Doniford Bay has a climbing wall and high wire skills facilities which also attract an additional cost. A recent addition is a fishing pool but it is not yet ready for fishing. Also the coastal path runs along the back of the site to Kilve one way and a bridge to Doniford Farm to the path to Minehead. A visit to Dunster with its historic castle and village is a must. Tropiquaria is a small tropical house and zoo approximately 2 mile from the site. Doniford Farm is situated just a short walk over the bridge from the site and is open to the public with a farm shop and a restaurant and with a play area for children. We have been on Doniford Bay for 30 years now and enjoy quiet serenity of the site together with the great facilities for the children and adults alike. 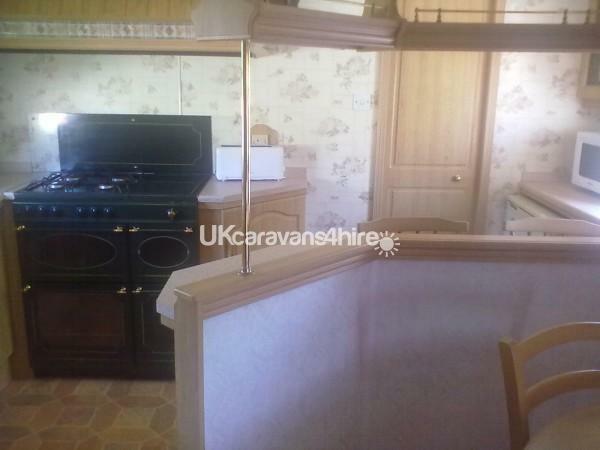 We hope that you enjoy your visit to our caravan. The post code is TA23 0TJ for those of you that use a sat nav.